Video and SEO Benefits. ExtraDigital Marketing Advice. Video is an increasingly important part of online marketing and can, when implemented correctly be a very good lead or sale generator. More importantly, if you have invested in a video, or multiple video, then how can you use this to best advantage? How you add video to your website has a major impact on the search marketing benefits you will achieve. There are different ways of adding video to a website, and each is best suited to a different type of website. This is because videos help website in several different ways. 4. Your own website hosting. For most businesses You Tube and Vimeo offer the advantage of better visibility - so if you use video as a lead generator then YouTube is often the best place to start. If you think your video might go viral this is also the place for it. However if you aim to promote your website domain name by video then you need to host the video on third party hosting (eg Vimeo Pro) or on your on webservers. 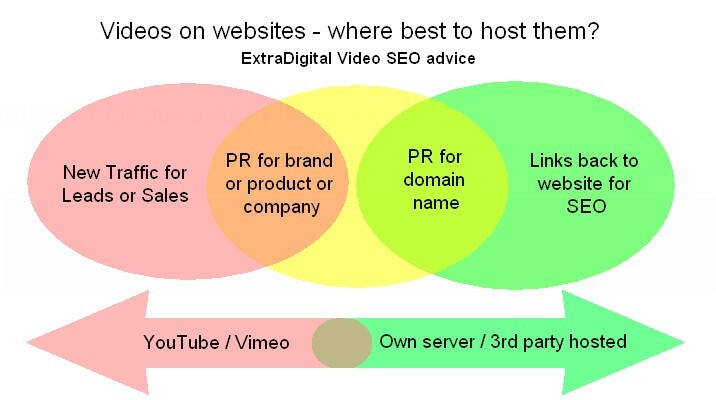 But however you host your videos, a video sitemap is useful. There is currently a window of opportunity for ‘link building’ via video content that is hosted on third party or your own servers. However caution should be adopted on using video in this way just for link building as the link building advantage will be stopped once this is ‘done for SEO’ by offshore SEO agencies. And producing the videos for this is a relatively costly exercise, both the video production itself but also the ongoing hosting. These make use of the rich snippets or microdata that started being used in about 2012 to give more structure to data on website. However video microdata or video rich snippets are very useful for businesses that naturally produce high quality videos of products or services. They can be especially useful for eCommerce shops with the “how to” type videos. If you are a manufacturer, YouTube and Vimeo are good – they have higher reach and your video will be shared (or stolen) and freely distributed – so your product will get the widest audience. But if you are an eCommerce store, and wish to promote the name of your store and your store only, then you may be better looking at a 3rd party hosted system or your own webserver. This gives you control over the links back to your domain name. You still encourage the videos to be used elsewhere, but using a link back to your domain name. Google appears to be changing policy on sub domains. They indicate that web pages and assets on sub domains will be associated with the main domain. This has a major impact for video SEO. It means you an host video on a subdomain and it will be linked with your main domain. This means you can have one webserver (efficient at serving web pages) and use a different server for streaming videos. Previously the hosting consideration was a limitation or a significant factor in the best way of using video on your website, as using the same serve for both could result in a slow website. It will be interesting to see how videos will change websites in the next few years, but as with any other website marketing, the key to success is interesting content that is correctly marked up. Looking for advice on how to best use video on your website? ExtraDigital can ensure the video is used to maximise it's marketing potential.